As soon as one refers to the Godavari delta, one is reminded of the sylvan surroundings and luscious green fields characteristic of the region, and the vibrant river Godavari which is the lifeline of the region. However, quite ironically, these images were all a distant dream for Geetha from Tallapudi village. Geetha has been suffering from various disorders of the eye. She suffered from cataract which prevented her from having normal vision, and as a double whammy, living in a remote village meant she could ill afford the treatment involved. But by a stroke of luck, Geetha’s brother studying at Vijayawada came to know of the LVPEI tertiary centre there. Eventually, Geetha came over and got herself tested. Dr. Arpitha who examined her at the City Centre, suggested surgical intervention. Though hesitant about surgery, the counseling provided by the doctor’s secretary Ms. Sirisha overcame Geetha's misgivings and she got herself operated. 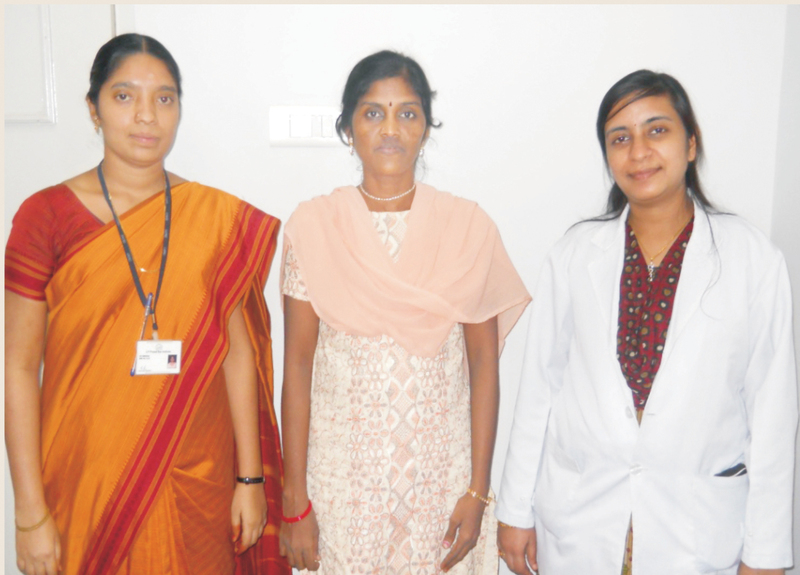 Sure enough, within a few days post surgery, Geetha's eyesight was completely restored and she cannot thank Dr.Arpitha and her secretary Sirisha enough for helping her out of the situation. The story of Naqi Haider Rizvi is truly inspirational for despite his vision problems, he propelled himself to become an industrial engineer through sheer perseverance, belief in oneself and family support. As he says 'disability is not inability'. Naqi and his sister have been patients of congenital glaucoma since they were 10 and 7 years old respectively. But thanks to the untiring efforts of his parents and particularly his mother, their 22-year long journey has culminated with his graduating to become an industrial engineer. To start with, he learned Braille and later on in his eighth grade learned JAWS software which helps in aiding people with visual problems. In the course of time, despite his limitation, he opted for science, resolute to prove to himself that he could do it. As the British Council was not willing to exempt him from doing away with the examinations, he sought the help of both a reader and a writer to complete his education till the university level. In 2009, the family moved to Saudi Arabia and Naqi continued his education in Riyadh where the professors were very supportive. All through, his mother was very focused on his education while his father took care of other aspects of life. Naqi is particularly appreciative of his younger sister for not complaining to their parents for all the attention that Naqi was getting. He needed friends and they too were intrigued with his ways. Thus he could make good friends. However, being unable to see, living independently was a daunting task but he managed to achieve that too. He was in Riyadh while the family was based at Dhammam when he learned various tasks like washing clothes, ironing etc. In the process he has also used speaking software called Talks which helped in his learning. He has also become conversant in using a mobile, a laptop, and CAD (computer aided design). Suffice it to say that with his dedication and a strong desire to excel, he was chosen to be the student keynote speaker on the graduation day at his university. Naqi says he wants to continue in the field of academia and has been associated with LVPEI for the past ten years, from 2003. 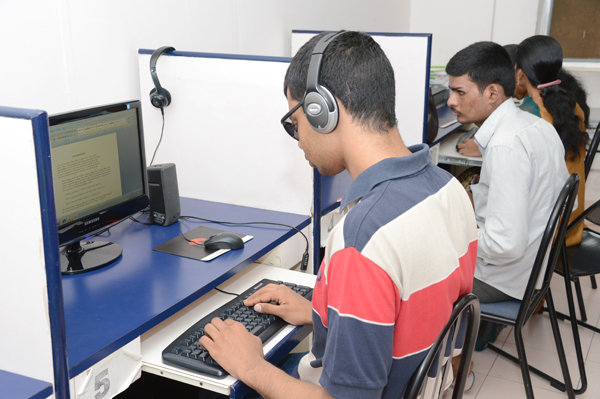 He insists that people with low vision are not disabled but differently abled. He believes that his success is not a one-man show but the concerted effort of many supportive people. He hopes that his story would motivate other people with similar problems. Regaining sight after living in a world of darkness is nothing but a miracle in Pradeep’s life. This is an inspiring story of a 14 year old boy who lost hope due to congenital glaucoma. When he was first brought to LVPEI Bhubaneswar, he was barely able to perceive light rays. Pradeep had managed to complete his 9th standard from a regular English medium school with the support of his doting parents, but he had gave it up because of poor vision. After an eye examination by Dr Aparna Rao, his family was informed about the poor outcome of surgery in view of a previously failed trabeculectomy performed elsewhere. But despite the poor visual prognosis, his father agreed for the surgery. Pradeep underwent Trabeculectomy + MMC surgery in both the eyes following which he surprisingly regained useful vision (binocularly 20/400). After successful surgery, he was further rehabilitated at the vision rehabilitation centre where he was advised to use assistive low vision devices. He was introduced to IT training and the audio mode of education to help him with his education. 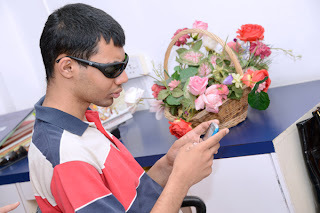 He now uses spectacles and assistive low vision devices, as advised, and is attending school regularly, performing all his daily activities just as a normal child of his age. He is very happy to be able to read his entire text book on his own. His father expresses his gratitude and immense happiness for the hospitality, co-operation and support of the ever helpful hospital staff. 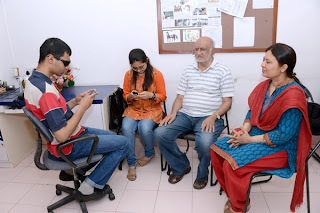 Pradeep has conveyed that the Vision Rehabilitation Center occupies a special place in his life since he has come to know of the many ways of restoration of sight despite severe damage to optic nerve due to glaucoma. Pradeep is now all set to prepare well for his future Board examinations and he dreams of continuing his higher education.